Pierre-François Ouellette Art Contemporain is pleased to present a solo exhibition of Kent Monkman at Centre Space in Toronto. This exhibition entitled Miss America will focus on three recent paintings (Miss America, Flow and Descent into Amnesia) and some videos including Dance to Miss Chief. The exhibition opens to the public on Thursday June 14th and run until August 11th. Kent Monkman has established himself as one of the most exciting and dynamic contemporary artists inCanada. For Monkman, history is not a static, repressive regime of misleading stereotypes and tired art historical tropes, it is a lithe medium ripe for re-imagining and re-population. In “Miss America”, Monkman has chosen as his inspiration Giovanni Battista Tiepolo. His reworking of Tiepolo’s ceiling cycle The Four Continents (1754), specifically America at Treppenhaus, Residenz at Würzburg, Germany, challenges the euro- western ‘Age of Reason’ through a re-casting of allegory and classism into a Canadian Indigenous context. Tiepolo’s cycle, epitomized, not only the lush allegorical language of Renaissance and Baroque conceptualizations of the world, but also the humanist philosophies that characterize the Enlightenment – the aesthetics of Classical Antiquity coupled with the search for imperial truth through reason to bring order from chaos. 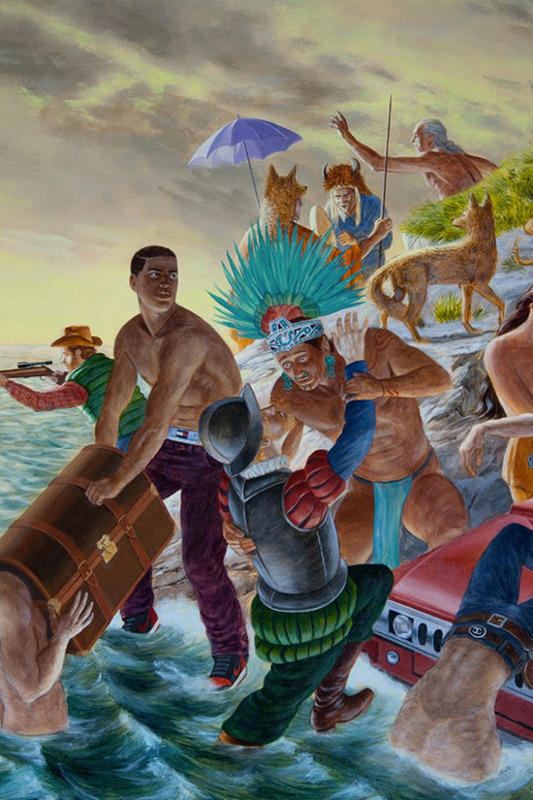 Likewise, Monkman, in appropriating these compositional, syntactic and iconographical tools, piles luscious fully-fleshed Indigenous and Non-Indigenous bodies into a climax of theAmericas that simultaneously assert and undermine the ‘rationalism’ of the Age. By Indigenizing the Euro-western canon he creates a tragic-comedy of multiple entendre, played out in a realm of mythic illusions, conscious and unconscious desires, myriad reflections on socio-cultural violence…..and acts of pure magic. He creates masterworks of subversion and sensuality, responding to and engaging an anti-colonial discourse steeped in the enduring of rationalism and imperialism within contemporary and historical imagination. These are constructions of presence that disentangle existing paradigms, bringing attention to the exclusiveness of popularly prescribed history. Monkman’s figures posit a profound Indigenization of the landscape in a way unimaginable to art historical dogmatists. His is an “Americas” peopled by robust bodies grappling within colonial imperial knowledge – no one is exempt. Their exuberant romp over the canvas is simultaneously a celebration and condemnation of cultural specificity undermined by the nation state. The complex imagery demands the viewer to look and orient themselves in what can only be an intensely political discourse of violent confluence and difference. It is a point, and site, of resistance and sovereignty for Indigenous people. And rising above it all…amid the tumult and the chaos is Monkman’s alter ego Miss Chief Eagle Testickle; dazzling, unflappable, supple and yes…regal, in all her sumptuous glory. Kent Monkman is an artist of Cree ancestry working in a variety of mediums. His work was featured in solo exhibitions at the Montreal Museum of Fine Arts and a National touring solo exhibition organized by the Museum of Canadian Contemporary Art and in group exhibitions such as Shapeshifting: Transformations in Native American Art at the Peabody Essex Museum, Remix: New Modernities in a Post Indian World at the Art Gallery of Ontario, Steeling the Gaze: Portraits by Aboriginal Artists at the National Gallery of Canada, We Come in Peace: Histories of the Americas at the Musee d’Art Contemporain de Montreal and The American West at Compton Verney, England. He was featured at the 2010 Sydney Biennale and the exhibition My Winnipeg at la Maison Rouge,Paris. His work Two Kindred Spirits will be included as part of the show Home on Native Land at the TIFF Lightbox this summer. A major gallery exhibition of new media works from celebrated Native artists from Canada, USA, Australia and New Zealand. Also, he is taking part of Oh Canada at Massachusetts Museum of Contemporary Art. The largest survey of contemporary Canadian art ever produced outsideCanada, which features works by more than 60 artists who hail from every province and nearly every territory in the country. This is the first solo exhibition of paintings by well-known Inuit jazz throat singer, Tanya Tagaq. This exhibition features a group of 10 dramatic paintings focuses on wildlife and transformation subjects depicted in highly coloured, imagined landscapes.